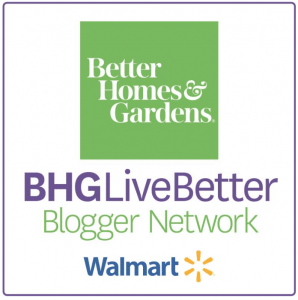 Disclosure: This post is in partnership with Better Homes & Gardens at Walmart. All opinions and product selections are my own. Are you ready to see a space in our home that has never been seen before on the blog or on Instagram?! My oldest son and daughter have a Jack-n-Jill bathroom in between their bedrooms and I LOVE it! It’s so great to have a designated space just for them and it’s sorta hidden from the rest of the house so we can keep typical mess hidden ;). For years it has sat pretty empty since no one sees it, but it’s time to finally give it some life! Today, I’m sharing the Kids Bathroom Decor I used to finish up their space. All of the finish work was done prior to us moving in. So that means, the cabinets, counter tops and backsplash were all picked out by the builder. I wish I could change some of them, especially the backsplash, but it still works just fine! All that was left for me was to decorate! For this project, I worked with the Better Homes & Gardens at Walmart . They have SO many fun bathroom sets to choose from and their towels are amazing quality and design for the price! I wanted to keep the decor neutral since it’s for both my son and daughter, but let’s face it, it would probably be neutral anyway! I found these number hooks from the line at Walmart and I thought they would be perfect in the space. The only thing I will caution is that the website description says “gray” but the numbers were definition more on the gray/blue side. So I painted over them in a charcoal gray. 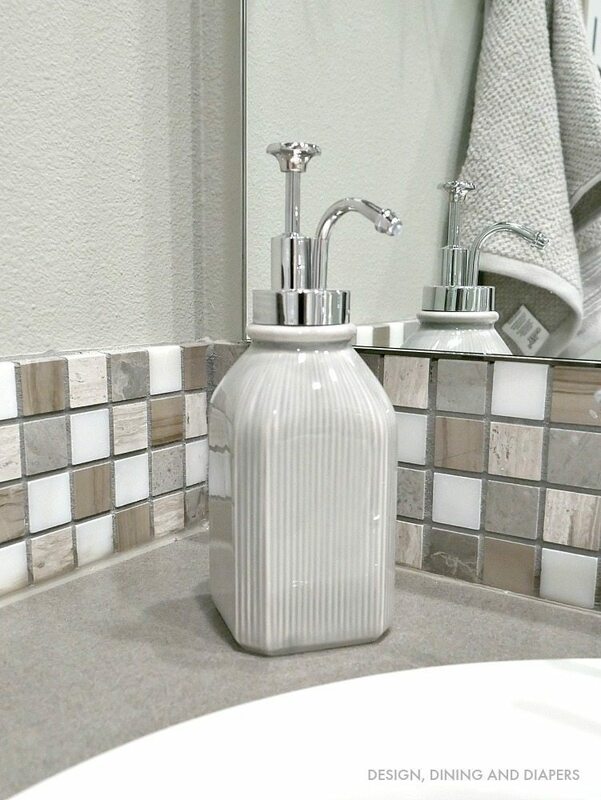 I switched out the soap dispensers for these gray, sleek ones. Super reasonable and I love the pump! There are also a few other items in the set, but I didn’t need them for this specific space. On the opposite side, I did another set of number hooks to match, and added some fun free printables! 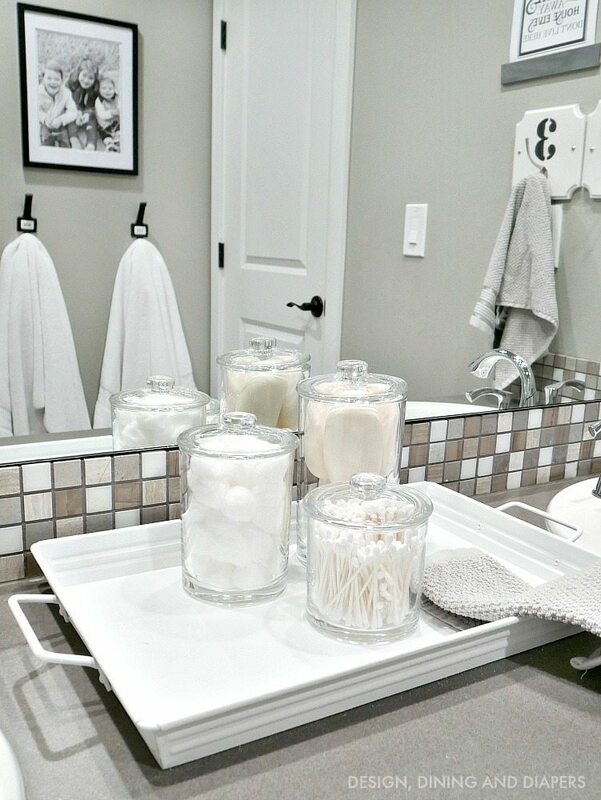 This tray is actually a Better Homes & Garden tray, but it comes in a galvanized finish. I wanted to keep everything pretty sleek in here so I painted the tray white to match my decor. It’s such a good price for a tray, so if you are looking for one check it out and you can always paint it. On the back wall I have towel hooks for the kids! 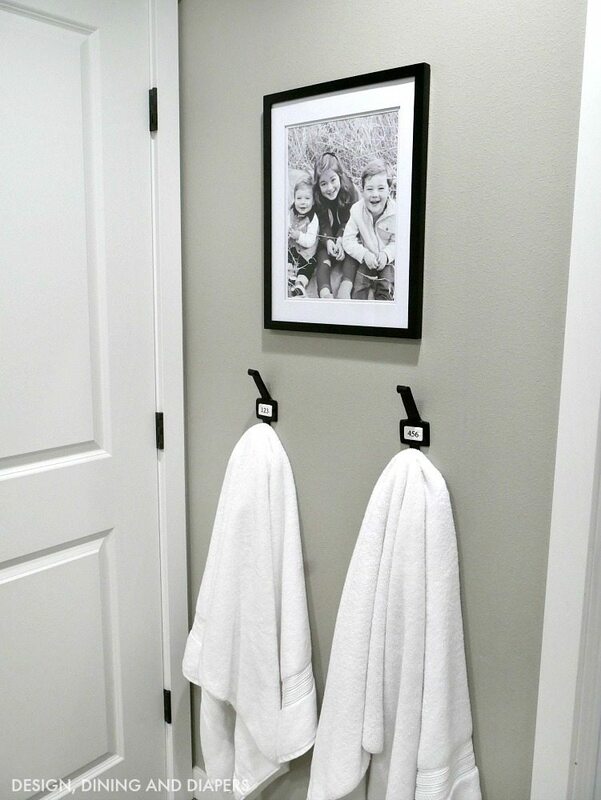 I’m not one for a towel rack, I never seem to fold them perfectly and can’t expect my kids to, so hooks are the go-to around here! Then, I framed a cute black and white print of the kid and put it in this fabulous matted black frame. 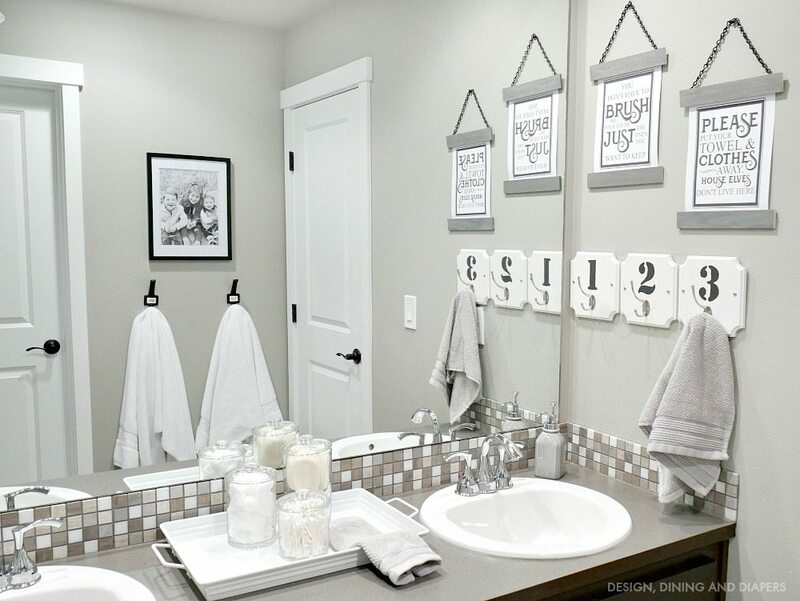 For the hanging wall art, I downloaded these super fun bathroom printables from The Mountain View Cottage and then created the same industrial hanging frames that I for our large print downstairs. Super easy, inexpensive and took minimal time! 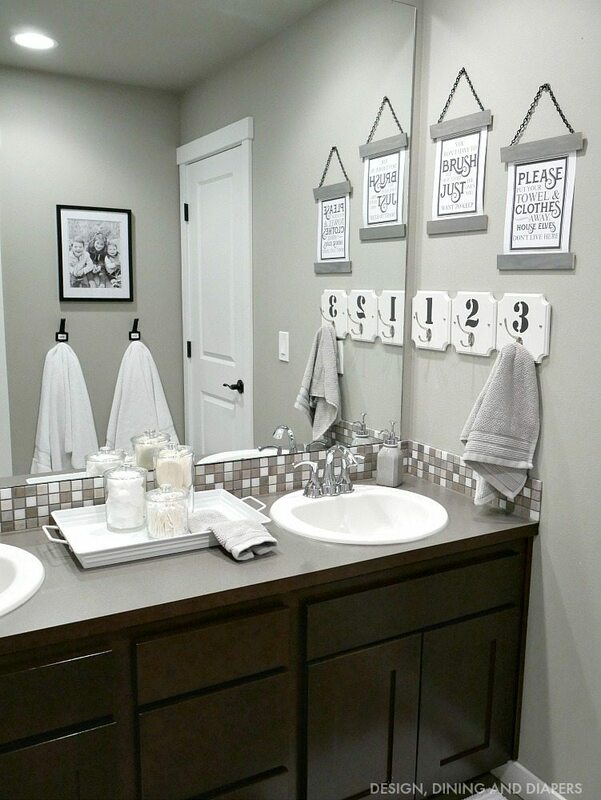 I wish I could say that the bathroom will look this clean all the time, but the reality is, it won’t. My kids are 6 and 3 and messsssyyyy. 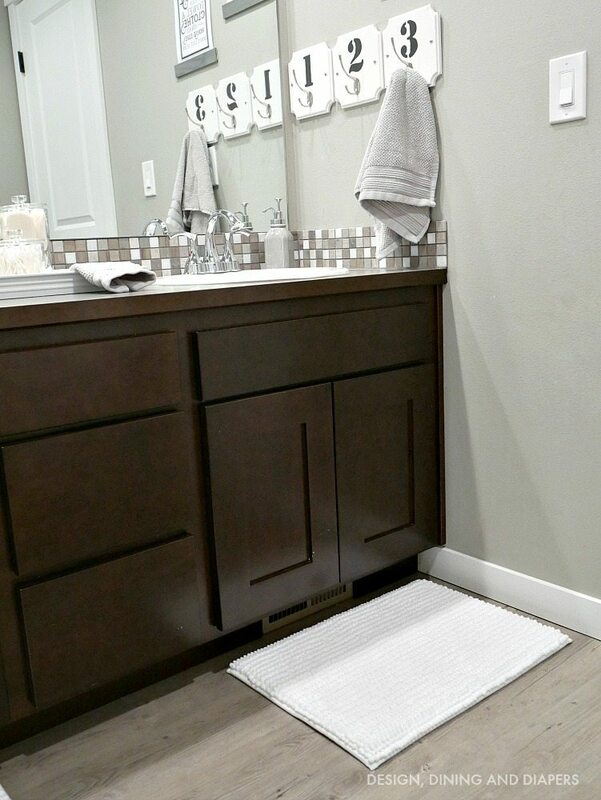 There is a good chance water will spill over at some point, so I added these soft white bath mats under each sink. I really love this space and I finally feel like it’s decorated just for them! The other thing I love about their bathroom is that the shower/toilet area are through a separate door, so you can block that area off. The door under the “toilet” sign leads you there! You can view more of that space here. 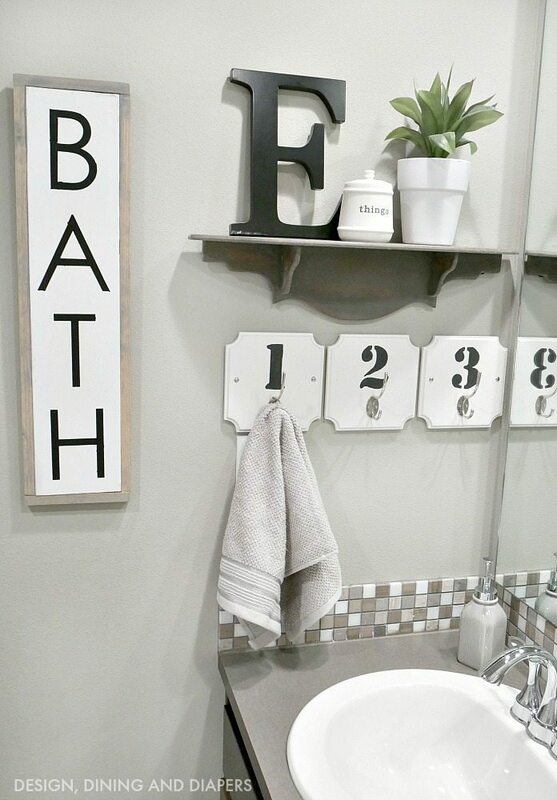 I thought the space was lacking a little something, so I made the BATH sign out of some scrap wood, and found the little gray shelf at an antique market I recently went to. And of course I had to include my favorite “Things Container” ! I love how this space came together. It finally feels finished and put together. Now I may let people come back here for a peek! Lucky kids, it’s a great space! 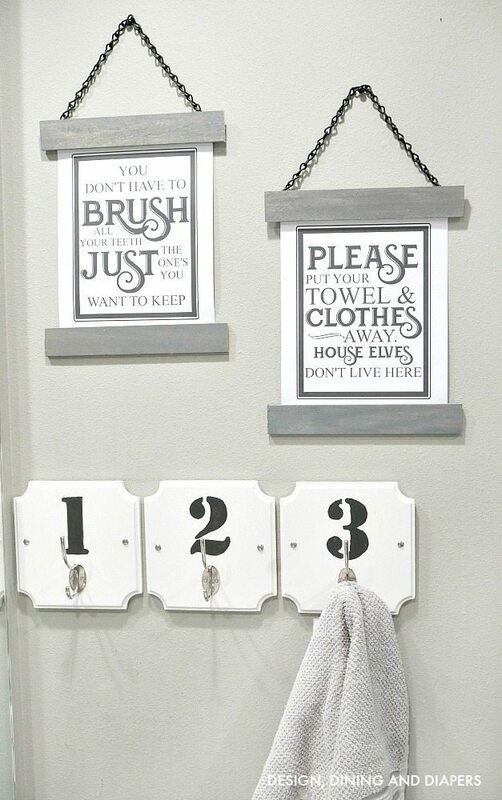 What is the source for the towel hooks? Hi! Are you referring to the black hooks under the picture? I picked those up on Dot & Bo a while ago, I don’t see them on there right now, they tend to rotate inventory. 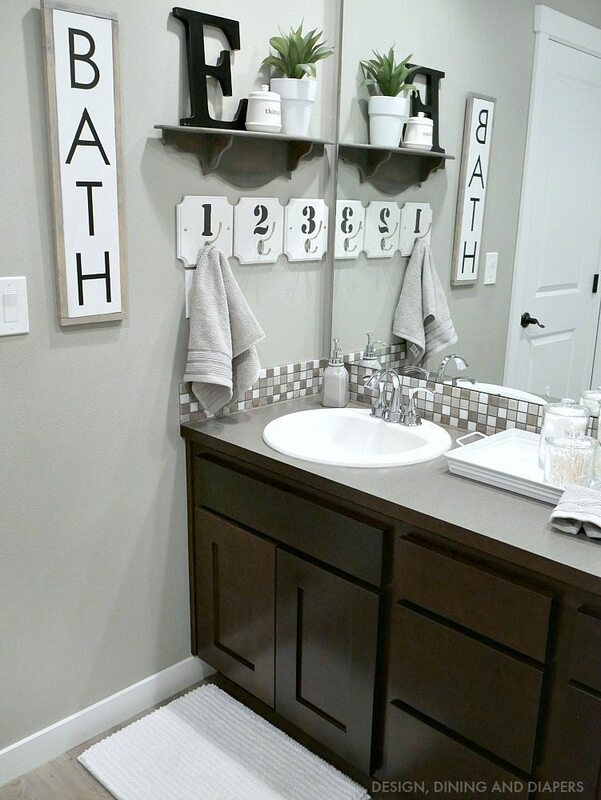 But the number hooks by the sinks are from Walmart, those are linked in the post! Where is the toilet sign from? I purchased it from Dot & Bo a few years ago, but I have seen it pop up other places as well. I would do a quick google search to see where it’s sold now. The walls are Sherwin Williams Colonnade Gray, although our builder may have tweaked the formula because some people have said ours appear lighter than theirs. 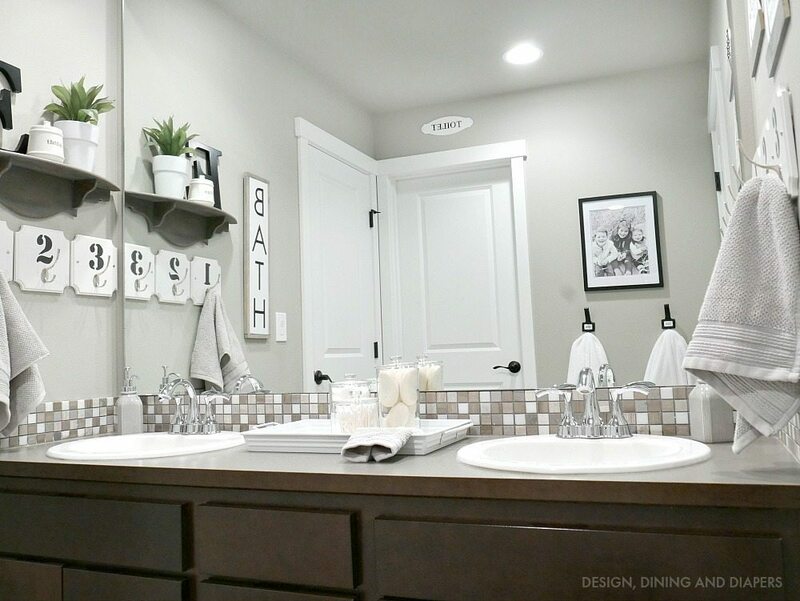 your kids are so lucky to have a great, talent, and creativetive mom such as yourself, because your bathroom is fabulous. What type of paper did you print the wall printables on? I love how they came out. Thanks! I typically use cardstock, it’s also great to have them printed at your local Staples, the printing is always so crisp! I do that for my larger prints.